← Definitions: what do I really mean? If you project light thought a narrow slit, a single band of light can be seen on a screen behind the slit. This is illustrated in fig. 1. If you project light through two narrow slits, one would expect to see 2 bands of light on the screen. However multiple bands of light appear. See fig.2. This is explained if light were waves. In fig. 2a on the left we see waves where two peaks overlap they create a higher peak. Where two troughs overlap they create a deeper trough. Both of these produce a brighter light. However on the right when a peak and a trough overlap they cancel each other resulting in no light. In fig 3 we are looking down on fig. 2. In the diagram the peaks of the waves are represented by solid black lines. The troughs of the waves are represented as dotted lines. We can see that the peaks and troughs of the waves are moving from the bottom of the illustration to the barrier with the two slits. The barrier is represented as a heavy dark blue line. The slits are two openings in the heavy blue line. As the waves pass through the slits they become circular waves emanating from the two slits. These waves overlap each other. In fig 3 the white arrows trace out the paths where the peaks overlap and the troughs overlap. These paths lead to where the light bands appear on the screen. The black lines trace the paths where peaks and troughs overlap and the light is canceled. 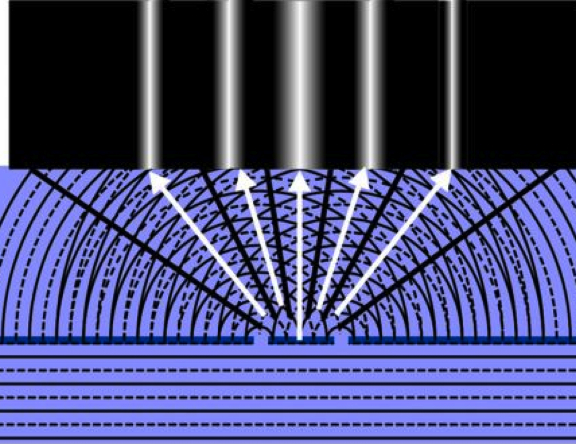 When a beam of electrons bounce off nickel crystals they produce a similar diffraction pattern as the light waves through the double slit. 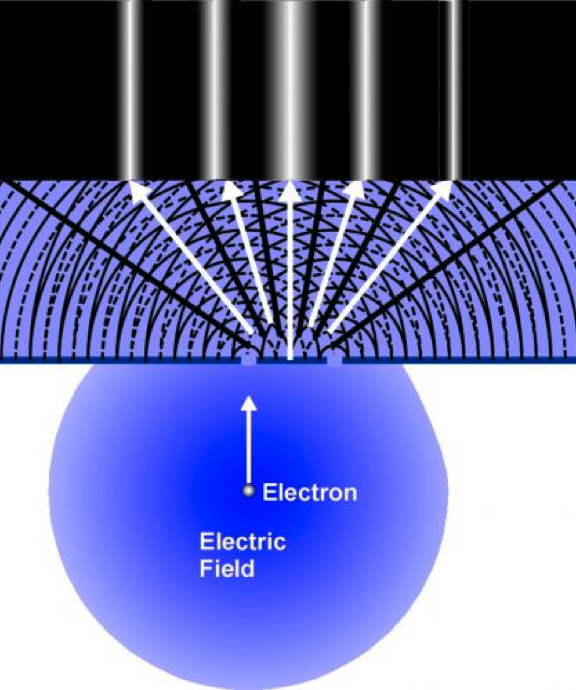 It is OK to think of the electrons as passing through a double slit as shown in fig.4. When these electrons hit the screen, now a phosphorescent screen they produce a similar pattern of bands. Thus the electrons exhibit wave features. One particle cannot pass through both slits. One particle passing through one slit should not have an effect on another particle passing through the other slit. 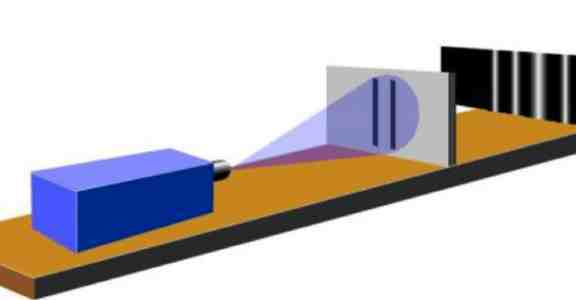 Then how can the electrons produce this interference pattern of separate bands? Richard Feynman was one of the world’s greatest theoretical physicists. Feynman suggested that particles must be viewed as traveling from one location to another along every possible path. A few of the infinity of trajectories for a single electron traveling from the source to the phosphorescent screen are shown in fig. 5. Notice that this one electron goes through both slits. I am sorry, but this sounds like an Alice in Wonderland explanation.